Students are feeling increasingly bold. Flickr/Chris Beckett. Some rights reserved. For students the take-home message from the summer budget is that fees are up, while maintenance grants are out. Although the raising of tuition fees in line with inflation is not nearly as dramatic as their tripling in 2010, the scrapping of maintenance grants is going to put the government under fire from a student movement which is growing in confidence. 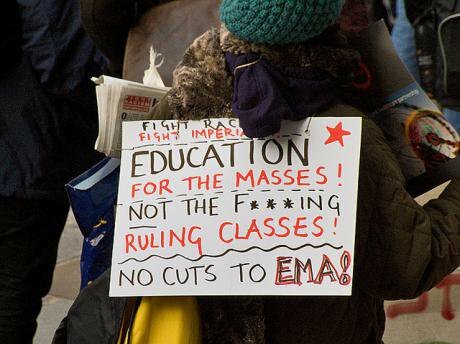 The 2010 student protests were never just about tuition fees. Also at stake were huge cuts to university teaching grants, and the abolition of the education maintenance allowance in England. The latter in particular drew thousands of working class further education students into a movement which stormed the Conservative campaign headquarters and found itself on the receiving end of police batons and horse charges in Parliament Square. When students were defeated on the headline issues, the movement began to wane. Despite occasional mobilisations on matters such as the doomed higher education white paper in 2011, over the following years many student activists either graduated, became mired in the politics of the National Union of Students (NUS), or turned their enthusiasm towards non-educational campaigns. With the tripling of tuition fees completed, the movement lost its hook. The axing of maintenance grants changes that, and the news comes at a moment when a new student movement is gathering pace. On 19 November 2014, around 10,000 students marched through London under the banner ‘Free Education – no fees, no cuts, no debt!’ During a national day of action two weeks later, a sit-in at the University of Warwick was broken up when police used CS spray on students and drew a Taser. The following day thousands turned out for a ‘cops off campus’ demonstration at the university. Meanwhile Scottish students are heading up a ‘living rent’ campaign and students in London have staged rent strikes over extortionate tenancies. A recent UCL open day was disrupted when rent strikers teamed up with students protesting against the exclusion of black scholars from the curriculum and fossil-fuel divestment activists to march through the campus, letting off a smoke flare. The decision to replace the maintenance grant with an extension of the student loan regime will disproportionately affect working class students, increasing the burden of student debt – already averaging £44,000 – and the pressure to find work in a dire graduate job market. This is despite evidence that young people are at the greatest risk of poverty due to insecure employment, such as zero-hours contracts. Already the National Campaign Against Fees and Cuts (NCAFC) has called an autumn national demonstration under the slogan ‘Free Education and Living Grants For All’, demanding universal living grants for all students. NCAFC says living grants should be funded through higher taxation of the rich, in contrast to George Osborne’s announcement that corporation tax is to be reduced to 18% by 2020. Corporation tax cuts since 2010 are due to have saved big business £16.6bn by 2021. With a new, multi-faceted student movement taking root across campuses, the government ought to be concerned by the righteous anger it is about to experience from students. Disillusioned by the NUS to the extent that students painted ‘scabs’ on the doors of its headquarters last year, and disenfranchised by the failure of politicians to relent from attacking the young, many students now feel they have no future and little to lose.